NBC News quietly edited a Monday piece after it omitted a part of Brett Kavanaugh's testimony that undermined the story's newsworthiness. The network obtained text messages indicating the Supreme Court nominee may have known about an allegation of sexual misconduct made by Deborah Ramirez in the days before it first because public knowledge in a New Yorker story. 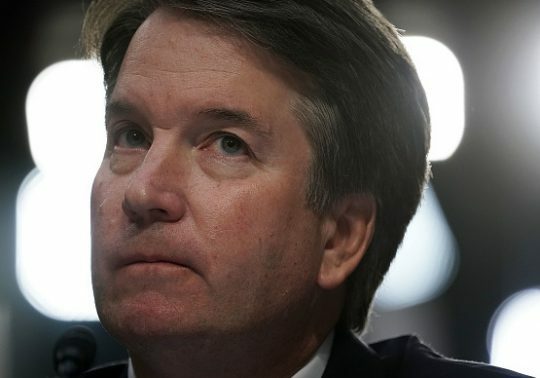 "Kavanaugh told the Senate Judiciary Committee under oath that the first time he heard of Ramirez’s allegation was in the Sept. 23 article in The New Yorker," the piece noted. "Kavanaugh was asked by Sen. Orrin Hatch, R-Utah, when he first heard of Ramirez’s allegations. Kavanaugh answered: ‘In the New Yorker story.'" Democratic and liberal politicians pointed to the story to claim Kavanaugh intentionally lied and committed a crime. NBC likewise promoted the story, claiming the texts "appear to contradict some of Supreme Court nominee Brett Kavanaugh’s testimony to the Senate Judiciary Committee." But the NBC story omitted the fact that while testifying under oath to Senate Judiciary staffers before his public testimony, Kavanaugh seemingly already admitted that he heard about Ramirez's allegations before publication, diminishing the value of their scoop. "The New York Times couldn't corroborate this story and found that she was calling around to classmates trying to see if they remembered it," Kavanaugh testified. "And I, at least — and I, myself, heard about that, that she was doing that. And you know, that just strikes me as, you know, what is going on here? When someone is calling around to try to refresh other people, is that what's going on? What's going on with that?" After readers on Twitter complained of the omission, that exchange was added to the piece the following day without an editors note and with only an indication in the byline that the piece had been "updated." Even then, NBC's paraphrase omitted the part where Kavanaugh said "I, myself, heard about that, that she was doing that." In now-public transcripts from an interview with Republican Judiciary Committee staff on September 25, two days after the Ramirez allegations were reported in the New Yorker, Kavanaugh claimed that it was Ramirez who was "calling around to classmates trying to see if they remembered it," adding that it "strikes me as, you know, what is going on here? When someone is calling around to try to refresh other people? Is that what’s going on? What’s going on with that? That doesn’t sound — that doesn’t sound — good to me. It doesn’t sound fair. It doesn’t sound proper. It sounds like an orchestrated hit to take me out." This entry was posted in Politics and tagged Bret Kavanaugh, NBC News. Bookmark the permalink.